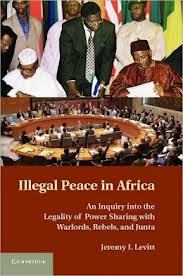 ILLEGAL PEACE IN AFRICA: AN INQUIRY INTO THE LEGALTY OF POWER SHARING WITH WARLORDS, REBELS, AND JUNTA, by Jeremy I. Levitt. 2012. New York: Cambridge University Press, 315pp. $99, ISBN: 9780521888684. 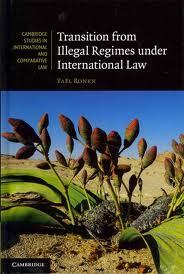 TRANSITION FROM ILLEGAL REGIMES UNDER INTERNATIONAL LAW, by Yaël Ronen. 2011. New York: Cambridge University Press, 356pp. $109, ISBN: 9780521197779. Reviewed by Kawu Bala, Bauchi State Judiciary, Nigeria. Email: kabaaz [at] gmail.com. International law comes to a focal point in the processes of conflict resolution through power sharing and transition from illegal regimes, but the law in this context has remained uncomfortable for international power players while dealing with peace arrangements and said transition in terms of legal recognition of territories. International law and practice have been criticised from varying ranges of references: from international interventions which are, widely seen to be “dubious” to such areas like power sharing which interestingly are the common activities in many hotspots of Africa; then comes illegal regimes as the countries struggle to govern their affairs on the basis of legality after emerging from annexation and other forms of outside control. The two recent books published by the Cambridge University Press on the subjects in consideration here should be of interest because of their uniqueness at a time when many difficult problems are confronting international law since the emergence of new states from colonialism, for example in Africa; coupled with the trickeries associated with the Cold War Era and the devastating conflicts that have plagued the world since then. Africa is often discussed as the hub of deadly ‘politics of survival’ (Roesler, 2011, p.8) and ‘the region with the greatest number of conflicts’ (World Bank, 2003). Since the independence of many African countries from the colonialists, the continent has witnessed numerous coups d’état, civil wars and other disturbing crises caused and still being caused by ‘juntas, rebels and other pirates de la loi’; the ongoing crisis in Mali and M23 rebel movement in Congo are enough, as good examples, in this regard . In the post-Cold War era major civil wars with alarming effect have taken place in four countries in the West African sub-region, specifically ‘in Liberia (1989−96 and 1999−2003), Sierra Leone (1991−2002), Guinea Bissau (1998) and Côte d’Ivoire (2002−2007 and 2010−2011)’ (Zoumenou and Loua 2011, p.230).’ Jeremy I. Levitt’s Illegal Peace in Africa: An Inquiry Into The Legality of Power Sharing with Warlords, Rebels, and Junta, is undeniably a welcome and in-depth assessment of power sharing strategy which is being used to maintain peace and harmony in governance in the event of crises that in recent years have affected many African countries. Levitt here uses case studies of Liberia, Sierra Leone and Guinea Bissau where Democratically Constituted Governments (DCGs) ‘were forced to [*156] share power formally with warlords, rebels, or junta seeking to unseat them’ (p.2). In Transition from Illegal Regimes Under International Law, Yaël Ronen analyses the ‘internal legal ramifications of the illegal regimes’ within the perspective of legality: the foundation of international law (p.1). If there is any good thing at the periphery about these two books it is their exposition of rare topics under the international law. For, conflicts of different ramifications have gained increasing attention from academics and policy makers alike in recent years but power sharing which heralds the end of wars has not been given adequate attention; likewise the legality or illegality of a territorial regime in its obligation to respect people’s rights to self-determination (Ronen, p.3). This concern is reasonable since conflict is the source of enormous human agony, but what of the need for a lasting, just peace without giving the “troublemakers” some sort of soft landing as power sharing entails in Africa? In other words, the basic right of human beings to determine their destiny in the scheme of global affairs has not also been given the fullest attention. Shouldn’t the question of punishing internal aggressors and refusing them the “rights” to benefit from their own crimes and people’s self-determination be given adequate analysis under international law? Scholars and students of international law as well as interest groups should then be thankful to Levitt and Ronen for raising these topical issues in their books and scrutinising the role of key players under international law. Illegal Peace in Africa thus questions the legality of power sharing as it is being used in Africa under the guidance of the international community, with the intention of peaceful negotiation of conflicts that more often-than-not characterises the continent. Levitt sees power sharing as legitimising the conduct of rebels and other ‘pirates de la loi’ when they take up arms against legitimate governments or democratically constituted authorities. As the world has seen in recent years this power sharing confers on the rebels key government positions perceived to be lucrative like ministries responsible for finance and defence and minerals such as oil, under the pretext of ‘political necessity and expediency’ (p.4). Levitt feels that agreements not based on law will not succeed (p.8). It is, according to Levitt, like giving a blanket authority to warlords, rebels and junta to ‘prey on resources of the state and its citizens’(p.21). Power sharing no doubt mocks the law. The irony as Levitt states is when it is seen within the framework of the ‘pre-existing constitutional rules’ of a country (p.97). Levitt asserts that power sharing accords which took place in Accra, Lomé and Abuja as a result of conflicts in Liberia, Sierra Leone and Guinea Bissau ‘abrogated no less than thirty provisions of the constitutions of Liberia and Sierra Leone’(p.99). Prominent clauses in the constitutions of democratic countries hold the constitutions as the supreme law of the land and anything to the contrary as incompatible and ‘extra-constitutional’ (p. 101). This is the most interesting argument Levitt will like readers to understand and accept. At least the constitutions of the three countries studied by Levitt are clear and why should those who have committed ‘horrific crimes’ (p.109) against [*157] innocent people be allowed to be part of the governments they so much destabilised? Levitt faults the conduct of the African Union and ECOWAS where he sees inconsistencies of a high proportion. To Levitt, therefore these two international organisations and by extension the United Nations’ flagrant double standards in world affairs, if you will, ‘have assisted in negotiating and sanctioning power sharing deals that clearly and intentionally contravened the core human rights, democracy, and governance principles’ which these organisations purport to uphold (p.129). This should be seen from the fact that power sharing in itself has ‘denied equal protection to victims of conflicts’ (p.131). One should expect revenge missions at the end of conflicts as warlords punish those who have not been on their side when conflicts subsisted since they now wield authority (courtesy of power sharing arrangement) in the affairs of governance of the people, who are of course victims of the same atrocities they (i.e. rebels etc) might have committed and inflicted. In these countries, the governments have been forced to share power with rebels. For example, Levitt says the Liberians United for Reconciliation and Democracy, and the Movement for Democracy in Liberia had power share with the National Transitional Government of Liberia. Whether or not this power sharing has had any positive impact in bringing the much needed peace remains to be seen. This is why, in Levitt’s criticism, power sharing should be regarded only as ‘stopgap measures’ which will not serve the best or long term interest of the African countries (p.167). Levitt points out also the hidden hands in African conflicts and by extension Africa’s destabilisation. Not yet done, he shows equally the manipulative trend in international affairs in the scramble for the vast resources in Africa’s troubled states. When conflict erupts it makes it virtually impossible to organise or regulate a state because attention is shifted from running the state to battling rebels, and some take this opportunity to loot and devour other lucrative spoils of office (p.168). At the centre stage of this are international diplomats and their organisations that persist in power sharing as if the world has no alternative capable of solving a crisis situation in Africa. Levitt’s statement is heartfelt, for power sharing has not provided practical solutions in Africa – the very reason why warlords agree to it in principle, as it paves a way for them to be part of authority (p.213). For instance, thousands have perished (in addition to the internally displaced), in the Liberian Civil Wars, despite more than ‘thirteen major peace agreements, half of which had power sharing dimensions and all of which failed’ (p.170). Whose interests then are those who profess to solve conflicts on behalf of these African countries serving? Surely not the interests of the victims of the senseless crises in Africa. Power sharing has transformed power dynamics in Africa as rebels and other warlords have resorted to this undemocratic mode of change of governments since the first coup d’état in Togo in 1963, which resulted in the assassination of its independence leader and first president, Sylvanus Olympio. A window has been opened for rebels and warlords to bargain and share power in the board rooms of international organisations [*158] under the very noses of diplomats from the west. The blame squarely lies at the core of their attitude in dealing with those who are supposed to be punished under international law. Here Levitt explicitly accuses the United Nations; indeed, the United Nations Credentials Committee and United Nations General Assembly were the same bodies that ‘endorsed the Accra, Lomé and Abuja accords,’ thereby approving amnesty to those who should be behind bars (p.218). One will agree with Levitt as he comes down hard on the United Nations for contributing to ‘Africa’s culture of impunity’ and why wars refuse to end (p.219). It is like saying any troublemaker could get away with his conduct no matter the suffering he has caused the law abiding citizens of a country. This brings us to the other side of Levitt’s argument where he admonishes the United Nations, African Union and ECOWAS and other regional organisations to pursue a conscientious role in conflict resolution in Africa. They should first study the ‘legal environment for peace.’ Hence Levitt calls on the United Nations to respect the position of African institutions which embody ‘anti-power-sharing’ and it should encourage the African states as well to ‘enforce what their own rules’ say (p.220). Levitt advocates the need to follow ‘constitutionally prescribed rules’ in dealing with conflicts in Africa. Levitt urges this to be the commitment of the political elites, warlords and other negotiators who have been “visiting” Africa in the name of peace settlement and plan (p.221). Central to Levitt’s argument is the Neo-Kadeshian Model of peace negotiation, which is alien to the core of present day peace negotiators from Western countries. The Neo-Kadeshian Model is as old as the African continent itself and should have been used to serve Africa healthily in its present day predicaments. Levitt reiterates that the Kadeshian Model ‘serves the highest moral good’ (p.223) and when it is applied to the cases of Liberia, Guinea Bissau and Sierra Leone, readers will not be far from ‘regrettably’ seeing how the law has been relegated to the doldrums as ‘the arbiter of legality’ (p.224). The Neo-Kadeshian Model in essence is a sure way of solving African problems by the use of African solutions (p.238). Levitt provides a sincere scholarly recommendation if peace is to be maintained in Africa that models that have been assembled in ‘academic laboratories and states in the West’ cannot be the standard to be used in a distinct continent whose philosophy and cultural background are entirely different (p.244). This statement has been echoed elsewhere by other academic writers like Anke Hoeffler (2008). Levitt indeed has confronted one of the most important and yet neglected issues of international law and politics. It a nutshell Levitt exposes the dishonest manoeuvres going on under the power sharing arrangements in Africa. What Yaël Ronen uses as the key method in the listed cases is that an ‘obligation of non-recognition in response to a violation of international law was (or is) generally considered to exist in their respect’ (p.10). Most interesting was that the international law and policies of most countries of the world were clear in the cases of Rhodesia, Namibia and the homeland states of Transkei, Bophuthatswana, Venda and Ciskei but that was not the case with the Soviet annexation of the Baltic States nor the Indonesian annexation of Timor-Leste. This is an important discovery in Ronen’s analysis which tends to show the lack of ‘collective’ will among the community of nations (p.10). It is, if I may again paraphrase, about the unfortunate attitude of the UN and other global institutions in dealing with similar cases sadly different. Justice has not been seen to be done by the victims of global politics of indifference which characterises our uncertain time. Ronen admits however that his work does not provide an exhaustive list of ‘territorial regimes that were or are still, denied recognition because of illegality’ (p.10). Ronen regrettably does not discuss Manchukuo’s status under China; Sadam’s misadventure in Kuwait in 1990; the unending Israeli claims of sovereignty over Jerusalem and over the Golan Heights; and, perhaps the oldest territorial crisis in Africa, that of Western Sahara under the control of Morocco since 1975. Ronen fascinatingly states that the United Nations has declared even Israel’s claims over East Jerusalem and Golan as ‘illegal’ but despite this she goes on to add that the case at hand is different for a number of reasons, including her assertion that ‘Israel acquired its control over these territories by action in self-defence’, among others (p.11). Much has been written on the Israeli’s conflict with the Arabs. Some readers will find it regrettable that she did not at more length address the annexation of the Palestinian lands so far declared to have been illegally seized by Israel according to the resolutions of the United Nations. This is a conflict that has been at the front of almost all global affairs whether in peace time or war discussions. From this, readers could see that Ronen’s book does not provide a presentation of the ‘law of occupation in depth’, and many instances were excluded because of the fact that the territories achieved endorsement by a handful of states (p.12). We are left wondering of the position of other cases such as Kashmir and other hotspots in the world. What fascinates is the case of Timor-Leste when the Indonesian forces occupied it (p.55). Part of the problem of international law, diplomacy and policy in this context is that we see the influences of countries in a naked power play. To Portugal, Indonesia was occupying Timor-Leste unlawfully, while Australia granted de facto recognition (p.56). Ronen reveals that the Security Council was less plain with regard to its Resolutions 384 and 389 of 22 December 1975 and 22 April 1976, respectively. The case of Timor-Leste [*160] has now become history but the attitude of the Security Council left much to be desired. Ronen also cites the conduct of the apartheid regime which refused residents of the Transkei, Bophuthatswana, Venda and Ciskei to ‘freely determine their political status’ (p.50). Again readers are left to see the United Nations as a toothless bulldog, for even the annexation and occupation of Cypriot has not yet been resolved (p.67). Is it because it involves Turkey, which seeks to be prominent in the European Union? The story is the same elsewhere with the exception of the Namibian Advisory Opinion (p.72) while all others seem ‘vague’ according to Ronen’s opinion (p.101). The world still needs courage if the international community desires to get things right. Ronen again draws the attention of readers to the effect of some of the treaties entered into while the territories were annexed or under the control of illegal regimes. In Rhodesia, we are made to see that the United Kingdom signed many treaties and the international community saw the United Kingdom as competent enough to keep on with the treaties ‘on behalf of the territory’ (p.115). There was no consistency however with regard to treaties entered into on behalf of the Baltic States (p.133). These so-called treaties (and by extension other enacted laws during annexation or colonial times, which in most cases have been codified to form the laws of countries annexed or colonised) often turn out to be clogs in the wheel of independence of some of the new states that emerged from colonialism. This happens, for instance, as terms in the treaties (no matter how disadvantageous) are held to be binding while the new countries in question were not the ones that negotiated the deals or enacted such laws in the first place. This again points to the irregular treatment being meted out in identical situations in global affairs. So it is safe to agree with Ronen here and just declare this as a sort of neo-colonialists’ agenda, as critics will want us to believe. In actual sense, therefore, the ‘power of non-recognition is limited’ and this makes it easy ‘to exist for lengthy periods of time’ (p.312). Ronen concludes that it is challenging to remove the legality of illegal regimes (p.319). This is of course the crux of her analysis as time and again illegal regimes go unchecked and unpunished. Who will come to the rescue since the countries which are supposed to speak out are the same beneficiaries of these illegalities? Ronen proves vividly that non-recognition is a weak tool in enforcing international law (p.320). She does not, however, say exactly how international law can be made effective. In my opinion Ronen has definitely left a key issue not discussed. Appraising the discussions in Illegal Peace in Africa and Transition from Illegal Regimes Under International Law readers will find unquestionably the need for the international community to wake up from slumber, of the realities of its actions and inactions as they affect nations. Both books stress the imperativeness of allowing international law to take its course in dealing with issues. Levitt and Ronen, no doubt have written well and with a sense of responsibility. The books under review have good bibliographies, indexes and both authors use rich source documents. The one departure is the omission of a word in Ronen's text, rendering a [*161] sentence “because [it] ignored Guinea Bissaus’s…”, (p.202), a minor fix for subsequent editions. International law is still evolving due to current challenges, but this should not be an excuse to warrant illegality in global affairs. Levitt's argument about power sharing in Africa is supreme in one the international community needs to confront. We are all victims of crises and the reputation of the international organisations and other regional blocs which purport to prevent wars is at stake. The world must see it as an obligation to construct an equitable and sustainable order in the interest of all humanity. As Anke states (2008, p.24) “The solution to the Africa’s troubles are not merely a technical and the problems will not be solved by technocrats in the west.” We can generalize beyond Africa and state for anyone who wants to comprehend what role international law or organisations should play or act in solving conflicts in Africa and elsewhere, in addition to how relationship between and among states ought to be as it applies to other territories, these two books are invaluable. Hoeffler, Anke. 2008. “Dealing with the Consequences of Violent Conflicts in Africa.” Centre for the Study of African Economies, University of Oxford. Online at http://users.ox.ac.uk/~ball0144/consequences.pdf (accessed 15 November 2012). Roessler, Philip. 2011. “The Enemy Within: Personal Rule, Coups and Civil Wars in Africa.” World Politics 63, No. 2 (April 2011). Online at http://www.epr.ucla.edu/Roessler.pdf. Accessed 15 November 2012. Stahn, Carsten. 2013. “‘Jus ad bellum’, ‘jus in bello’ . . . ‘jus post bellum’? –Rethinking the Conception of the Law of Armed Force,” European Journal of International Law. Online at http://ejil.oxfordjournals.org/content/17/5/921.full. (accessed 7 March, 2013). World Bank. 2003. Breaking the Conflict Trap: Civil War and Development Policy. Oxford University Press. Zounmenou Dossou David and Reine Sylvie Loua. 2011. “Confronting complex political crises in West Africa: An Analysis of ECOWAS responses to Niger and Côte d’Ivoire.” Institute for Security Studies Paper 230. Online at http://www.iss.co.za/uploads/Paper230.pdf (accessed 15 November 2012). Copyright 2013 by the Author, Kawu Bala.